A menu for the Incurable Epicureans in St. Louis, featuring recipes calling for seasonal vegetables and fruits and local Missouri products. 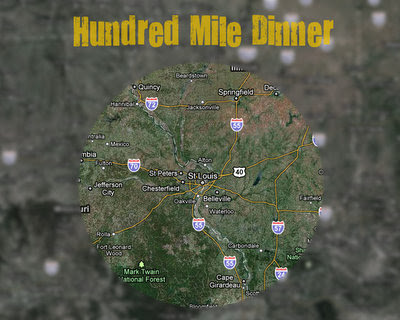 Why A Hundred Mile Dinner? You'll be wondering what's up, why I'm deviating from the standard recipe column. Here's the scoop. In late May, the Kitchen Parade and A Veggie Venture recipes that follow will be cooked by a supper club called the Incurable Epicureans (IE), a food-loving subset of the Missouri Mushroom Society. Each year, the group cooks four theme-focused dinners for 40 to 50 people. Over the last 12 - 15 years, the Incurable Epicureans have focused dinners on the work of chefs and food luminaries such as Julia Child, James Beard, MFK Fisher, Alice Waters and most recently, Marcella Hazan. (A Veggie Venture readers might remember Marcella Hazan's recipe for Spinach Ricotta Gnocchi with Creamy Tomato Sauce, including its bad-bad musical pun.) They have explored food traditions from many countries, from Native Americans, even Medieval times. I am so honored for IE to feature recipes from my collection. Linda Rolby (the IE coordinator) and I decided to call it the "Hundred Mile Dinner" -- and to challenge the group to source its food from a hundred-mile radius. Long-time readers know that my ideas about the importance and definition of "what's local" are unconventional, so with any luck, our attempts to source local Missouri ingredients should provoke fascinating table conversation. Perhaps you might be inspired to host your own Hundred Mile Dinner? The growing season is the right time of year for one, it could be fun to try with a few like-minded friends. What's the Meaning of "Local", Anyway? It's a great time of year to find local foods. The menu features asparagus three times and strawberries and rhubarb twice -- tis the season! There's a rice dish and a black walnut cake -- that's because rice and black walnuts are both grown in Missouri. So think about the ingredients in the recipes you decide to make and whether it's possible to find a local source. But what does "local" mean, anyway? In St. Louis, we are lucky that our city is home to numerous organizations that sell local produce, meat and other foods. These are the obvious places to look for "local" foods. But these organizations are small. They have limited distribution. Most sell only during the growing season and even then, often the local foods cost more than the supermarket counterpart. I read recently that even if CSAs and farmers markets were to continue to grow at current high growth rates for ten years, their combined sales would still only represent 5% of the food market. This isn't to say that innovative start-ups, CSAs and farmers markets aren't important. But it IS to say that to affect massive change in our food production and distribution systems, their contributions are tiny drops in the bucket. And yes, they sell some local food too. Straub's sells Missouri food products on its website and the Clayton store hosts the Clayton Farmers Market. Both Schnucks and Dierbergs feature local produce (tomatoes, corn, peppers, peaches, apples) during the growing season. Ironically, it's the very size of these companies that prevents them from selling more local food. When Schnucks looks for suppliers of local produce, it needs enough for more than 100 stores, Dierbergs enough for 23 stores. Ironically, this means that it's easier for Whole Foods' two locations in St. Louis to sell local produce than it is for Schnucks or Dierbergs. Can Schnucks and Dierbergs do better? Maybe, especially if we actively lobby / encourage them to figure out workable ways. But the message is, when it comes to food in St. Louis, local ownership needs to count too. Dollars spent at Schnucks, Dierbergs and Straubs stay in St. Louis, they're not shipped to California (Trader Joe's) or Texas (Whole Foods). If we want to affect the food supply in St. Louis in a big way -- in rivers the size of the Missouri and the Mississippi not drop by drop into a small bucket -- we have to court the demand side from the big grocery players, not just the supply side from individual farmers and growers. So, Incurable Epicureans, work toward local ingredients for our Hundred Mile Dinner. But please, don't stress. You might not find a local ingredient or you might find the local choice more costly than prudent -- and that's okay. It's the thinking that's the goal here. Without further ado, here's the menu, I hope you love the choices! Kitchen Parade is written by second-generation food columnist Alanna Kellogg and features fresh, seasonal dishes for every-day healthful eating and occasional indulgences. Never miss a recipe! If you like these recipes, sign up for a free e-mail subscription. If you like Kitchen Parade, you're sure to like my food blog about vegetable recipes, too, A Veggie Venture. Follow Kitchen Parade on Facebook! But even better, try to stay within "100 feet". PLANT A GARDEN! Even if you live in an apartment, try container gardening on your patio, or go to the roof (see ECHONET.ORG for urban gardening ideas). Work cooperatively to start community gardens. We waste so much valuable land in this country. Not only have many forgotten how to cook, many many more have forgotten how to grow. Q ~ Some times we forget the most obvious answer of all! Thanks for the reminder! Others, here's the link to EchoNet.org.